Inch and Miles: The Journey to Success by John Wooden, Peanut Louie Harper, et. al. Join us for a book reading of Inch and Miles: The Journey to Success. Reading by Peanut Louie Harper, a former world-ranked professional tennis player who played on the pro tour for 16 years and won 14 national junior tennis titles. Q&A and autograph session with Mallory Burdette, former Stanford Cardinal women's tennis player, currently ranked number 78 in the world, who is competing in the Bank of the West Classic. The book follows two young characters, Inch and Miles, who embark on a journey to discover the Pyramid of Success and learn how to achieve their personal best. The book was written by legendary Coach John Wooden, who illustrates valuable character traits and wisdom through this story. Listen to a pro tennis player read her favorite Pyramid blocks and define her own version of success. Join us for a book reading of Inch and Miles: The Journey to Success. Reading by Peanut Louie Harper, a former world-ranked professional tennis player who played on the pro tour for 16 years and won 14 national junior tennis titles. Q&A by a professional tennis player (tba). John Wooden is currently considered a "single author." If one or more works are by a distinct, homonymous authors, go ahead and split the author. 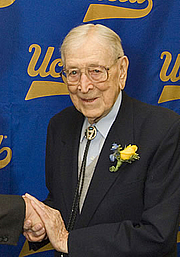 John Wooden is composed of 7 names. You can examine and separate out names.